On 29 May, 2018, the United Nations Security Council Counter-Terrorism Committee (UN CTC) held an open meeting with the support of the UN Counter Terrorism Executive Directorate (UN CTED) on the topic of countering extremist narratives. 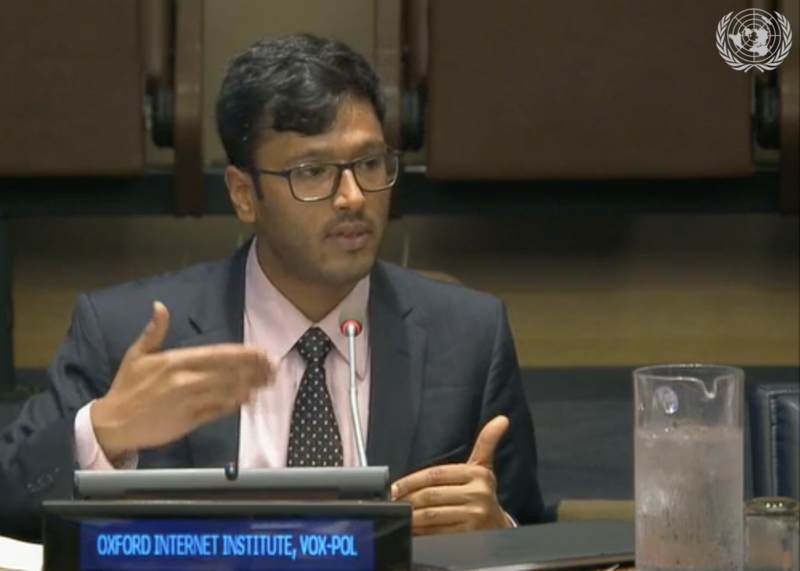 VOX-Pol researcher, Bharath Ganesh of the Oxford Internet Institute, University of Oxford, travelled to the UN headquarters’ in New York, and presented in Session III, titled “Online incitement, terrorist narratives and violent extremism conducive to terrorism.” In sum, Ganesh made two recommendations: that hate speech cannot easily be separated from violent extremism; and that it is the responsibility of governments, private sector companies, and civil society to incorporate a diversity of voices into the solutions being developed to counter extremism online. The meeting brought together a global group of practitioners and researchers that shed light on the various initiatives attempting to understand, and counter, violent extremism across the world. Other panels stressed the importance of public-private partnerships, the role that civil society can play in countering extremist narratives, and new trends and developments in terrorist narratives. 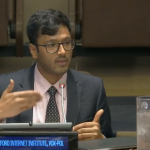 The sessions were webcast, and are available on the UN CTC website, along with details of the opening and closing remarks of the Chair of UN CTC and the Executive Director of UN CTED.